Pabbata-raja made the mountain or rock his centre of ritual worship. 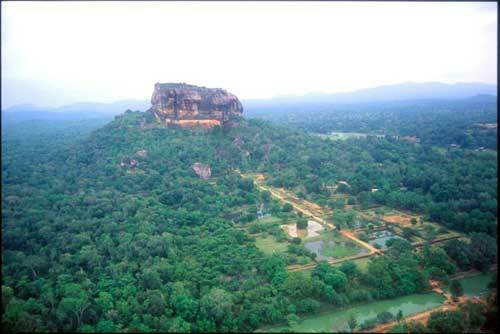 The mountain at Mihintale, known in pre-Buddhist times as Missaka pabbata, and the rock at Sigiriya (above) were two of the main centres where pabbata-raja kings held their festivals, involving both rain-making and fertility. And may the country become prosperous! How did the king make rain? By means of both imitative and contagious magic. In imitative magic the rites and rituals performed resemble the result desired. Contagious magic uses some object that has some contact with whatever one wishes to influence. These objects derive their magical power by being parts of a whole that has been endowed with such magic. In imitative magic the king imitated the gods in heaven, the de:va-lo:ka. The lord of de:va-lo:ka was Indra in Hindu mythology and Shakra or Sakka in Buddhist mythology. 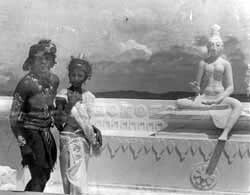 In Buddhist literature, he was also given the name De:va-Indra or De:ve:ndra, the lord of the gods. The king, on the other hand, was the lord of the human world, the nara-lo:ka. Hence he was given the name Nara-Indra or Nare:ndra, meaning the Indra of the humans. Pabbata-ra:ja, as the name indicates, is the king of the pabbata, Mountain or Rock. Bo:dhi-ra:ja is the king of the Bodhi, the sacred tree of the Buddhists. With the introduction of Buddhism to the island, the ideal of Bodhi-raja gained popularity over the ideal of Pabbata-raja, which was the one found in pre-Buddhist Sri Lanka. The mountain at Mihintale...where pabbata-raja kings held their festivals, involving both rain-making and fertility. Pabbata-raja made the mountain or rock his centre of ritual worship. The mountain at Mihintale, known in pre-Buddhist times as Missaka pabbata, and the rock at Sigiriya were two of the main centres where pabbata-raja kings held their festivals, involving both rain-making and fertility. "The charming plateau of Ambattala on the Missaka mountain would have been considered an excellent site which nature had provided for rites of fertility, and would have been chosen as a spot worthy of the gods, and to imitate them in their celestial abodes" (14.99). Bodhi-raja kings, on the other hand, made the bodhi tree their centre of ritual and worship. 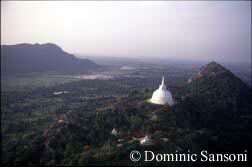 "The establishment of the sacred bodhi tree at Anuradhapura became very significant in Sinhalese kingship. In the Sinhalese kingdom, the bodhi became the main centre of ritual, at least until the arrival of the sacred tooth relic about six centuries later." The powers of the bodhi in producing rain will be discussed in a separate chapter. The Sinhalese king's sympathetic magic took the form of a procession (perahaera) held in the Sinhala month of Aesala, which marks the height of drought. Aesala perahaera is an annual event that takes place even today in several Buddhist temples, the most important one being at the temple of the Sacred Tooth at Kandy, the last capital of the Sinhalese kingdom. "Whether connected with the cult of the gods or the worship of the Buddha the Aesala festivals were rainmaking ceremonies" (14.109). The symbolic relationship between the Aesala perahaera and the deeds of gods in producing rain is remarkable. According to Hindu mythology, Indra's association with water centres round the story in which lie slew Vritra the dragon, who had encompassed the rivers. "Indra slew the dragon, a giant titan that had been couching on the mountains in the limbless shape of a cloud serpent, holding the waters of heaven captive in its belly. The god flung his thunderbolt into the midst of the ungainly coils; the monster shattered like a stack of withered rushes. The waters burst free and streamed in ribbons across the land, to circulate once more through the body of the world" (32.3). This is the feat that is enacted on Earth, the king taking the place of Indra. 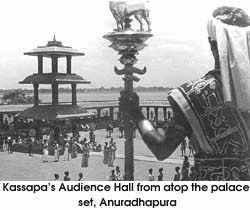 In the Aesala perahaera, the king parades the streets, accompanied by elephants and music. "At the height of the procession" writes Godakunibina, "the king accompanied by his ministers, officers, leading citizens an(] the pretty ladies of the kingdom joined the perahaera, himself riding in his golden chariot drawn by eight white horses. This is in imitation of Indra going about in procession in heaven, in his heavenly chariot, Vaijayantha, accompanied by hosts of gods and goddesses. The elephants accompanying the perahaera represent the clouds, and the drums and music, the noise of thunder and water" (14.122). Two of the main elements in the structure of the perahaera are the two rites known as kaphitavi:ma (kap-planting) and diya-kaepi:ma (water-cutting). Both emphasize the imitative aspect of the phenomenon. In the rite known as kap-planting, which marks the beginning of the perahaera, a piece of wood referred to as kap is set up in the premises of the temple. This symbolizes the thunderbolt which Indra carries. The grand finale of the ritual is the rite known as water-cut ting, which symbolizes the release of the waters by Indra after slaying the serpent who guards it. Seneviratne describes how this rite is performed at the termination of the Kandy Aesala perahaera. "Me four devale perahaeras, with their kapuralas or ritual priests, now proceed to the Getambe ferry for the diyakapima rnangalle or the water cutting ceremony. The four kapuralas walk into the river each accompanied by four attendants bearing swords and water pitchers. just at dawn, the kapuralas strike the water with these words while the attendants empty the water that had been collected the previous year, and fill the pitchers afresh from the very point at which the blade of their swords struck the water" (2 8d. 70). In the Kandy perahaera the Buddha's Tooth relic, which is by itself a sacred relic that has power to produce rain, is taken in procession to enhance the magical power of the ritual. By re-enacting this heavenly deed on earth, the king took upon himself the royal duty of producing rain in due season for the good of his people. Another fine example of popular rain magic employed by the state machinery is recorded in the Mahavamsa, in its account of King Upatissa (365-406 AD). In the official ritual, one finds incorporated many of the rain-making rites: filling vessels with water, reciting of the Ratana-Sutta, pouring out water on the streets, and the king and the people observing precepts leading to a moral life. 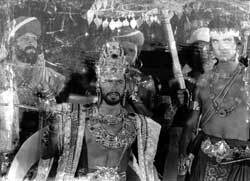 The belief that the righteous king could control rain was held by the Hindus as well as by the Buddhists. King Elara, who reigned for forty years at Anuradhapura in the first century BC, was a Hindu who came to this country from South India. Though a foreigner, he commanded the respect of the Sinhalese Buddhists, because of his righteousness. Even the Buddhist monk who compiled the Mahavamsa did not fail to record the fact that Elara was a righteous king who could and did control rain. It is said that Elara had, at the head of his bed, a bell hung up with a long rope so that it could be rung by those who desired justice. The king's role as the Rain-maker is further enhanced by his use of the epithets, Megha-vanna (Rain-cloud-hued) and Sila Megha (Rock Rain-cloud). Sinhala records use Me-van. According to Mahavamsa, Gothabhaya (249-62 AD) was also called Megha-vanna-Abhaya, and he is perhaps the first Sinhalese king to use this epithet. His grandson was Siri Megha-vanna (301-28 AD), whose reign coincides with tile arrival of the sacred Tooth relic of the Buddha. Sinhala records refer to him as Kit-Siri-Mevan, implying that his personal name was Kit (Skt. Kirti; Pali. Kitti). About two and a half centuries later Kitti Siri megha II (Sin. Kuda Kit Siri Mevan) ascended the throne. Siri Megha Vanna seems to have been replaced later by Sila Megha Vanna (Sin. Sala-Mevan). According to the ‘Chronological Table of Ceylon Kings' compiled by Don Martino De Zilva Wickremasinghe (published in Epigraphia Zeylanica, Vol. 1. III, Part I), the following kings used the epithet Sila-Megha or Sala Mevan.